Embossing cards, or rather, paper embossing, is how you can achieve that glossy, textured, raised look you sometimes see on fancy patterned papers, or even the fancy raised print you sometimes find on invitations purchased from commercial printing presses. Paper embossing is actually quite simple. What I will cover here is rubber stamping embossing (or heat embossing), as it is the easiest and most appropriate for making handmade invitations and cards. 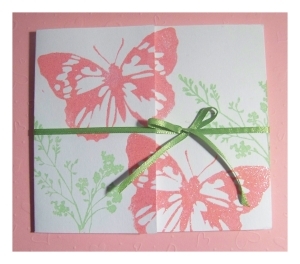 To emboss paper with rubber stamps you will need three things; embossing ink, embossing powder, and a heating tool. You start by stamping an image with the embossing ink. 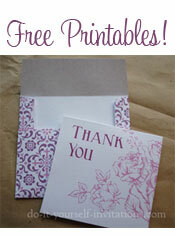 Immediately after applying your image you will sprinkle some embossing powder onto the image. Shake off the excess onto a paper plate or scrap paper (or into the trash - whatever your preference) and make sure to tap off any excess. Not plug in your heating tool, turn it on, and hold it over your project. You will know it is working as the powder and ink will begin to darken and kind of bubble and shrink at teh same time. In seconds it sort of melts into a nice glossy raised piece of art! It is really gorgeous and very fun to play with. The results really are stunning. Embossing Ink - Embossing ink is the basis of your heat embossing project. I like to keep some good old clear embossing ink on hand and then use different colored powders to do my card embossing for greetings and handmade invitations. But you can also find colored embossing inks, and I have even used regular stamping ink and sprinkled embossing powder over it for some pretty nice results. Embossing Powders - These come in every color under the sun. You can find them in bright vibrant hues, as well as metallics, and even distressing powders to give an antique and vintage look to your projects.